For the past few months, I’ve been taking a history class in pursuit of my master’s degree in political economy. This class covered the era from Christopher Columbus (late 1400s) through Abraham Lincoln (mid 1800s). Part of the class requirements is an oral examination, where the student is peppered with questions by the mentor for fifteen minutes. Anything is fair game, meaning that you have to know and understand four hundred years worth of dates, major events, prominent figures, and everything in-between. In addition to defending secession, describing the modern effects of slavery, talking about the Trail of Tears, defining the justice of self-imposed slavery, explaining mercantilism, the ineffectiveness of tariffs, and the imbalance of power in the pre-Civil War era, I was asked which President (Washington through Lincoln) I considered to be the worst. My answer audibly surprised many of my classmates, since I chose an individual who was and is a favorite (and near idol) of many: Abraham Lincoln. Exams at George Wythe University don’t involve short answers by any means, and so I proceeded to justify my decision and explain my reasoning. I started by explaining that my interpretation of “worst” as it related to my answer was that the President’s actions had to have the most long-lasting, far-reaching negative consequences. Thus, while every single President up to and including Lincoln had had their fair share of blunders and poor choices, I was looking to apply the label of "worst" to the President whose deplorable actions were still being felt the most today. This most easily applies to Abraham Lincoln. Oddly, Lincoln has become idealized by numerous historians and idolized by teachers and textbooks. The "Savior of the Union" is credited with abolishing slavery, keeping the rebelling South in check, and preserving our nation. On such sound bytes an entire legacy has been built, leading Lincoln to be one of the most favorably looked-upon Presidents of our time. Even I conceded last night that the man was a gifted lawyer, a brilliant mind, a persuasive politician, and in many ways a good man. But from my perspective, and leaving aside the inaccuracy of the other erroneous claims mentioned above, the lasting consequences of his actions to beat the South into submission have had a far more detrimental effect than those of his predecessors. Before Lincoln, our Union was an organized federation of sovereign states, collectively and generally referred to in the plural as "these united States". Inherent in the reference itself is the understanding of multiple, sovereign entities joined under a common cause and creed. After the Civil War—one in which Lincoln (among other things) suspended the Constitution and habeas corpus; launched a military invasion without the consent of Congress; imprisoned thousands of Northern citizens without trial; shut down hundreds of opposition newspapers and imprisoned dozens of their owners and publishers; censored all telegraph communication; nationalized the railroads; confiscated firearms; interfered with elections using federal troops; and deported his most outspoken critic, Democratic Ohio Congressman Clement Vallandigham—the voluntary confederation of states was replaced with a blood-soaked, mandated participation in a centralized, all-powerful government. The relationship of the states to the federal government transitioned painfully from one of symbiosis to subservience. Forever after, the federal government would be a singular entity: "The United States". 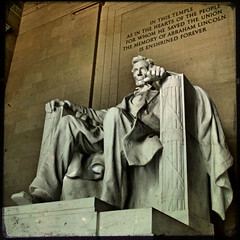 Abraham Lincoln’s actions in forcefully requiring the perpetual participation of every state in the “Union” finally answered Calhoun’s rhetorcial question, and ultimately set a foundation for the government we now enjoy: consolidated, absolute, based on the unrestrained will of the majority, with force, threats, and intimidation being part and parcel of its modus operandi. I support this argument, as it was the philosophical basis for our Declaration of Independence and subsequent secession from the British empire. What I cannot support is the use of military conquest and catastrophic loss of life—death which in terms of our current population would exceed five million individuals—to force participation in a government. Anybody who sides with Lincoln’s actions must of necessity side with King George’s coercive military attacks on American colonists in the Revolutionary War, for the underlying principles are the same. Despite any noteworthy actions worthy of emulation, Abraham Lincoln stands in my mind as the worst president of "The United States", for the simple reason that his actions are still adversely felt today (well, by anybody who understands our history and pays attention to current politics). Other Presidents’ actions have faded into the history books, whereas those committed by Lincoln in the name of the Union’s preservation exist in our day as the solidified foundation of federal tyranny and centralized governmental omnipotence. "The Worst President of The United States"
"wasn&#8217;t a fan of Abraham Lincoln"